The most popular woven label design is black logo on a white background, or vice versa. This conceptual and harmonic use of simple colour seems to express an idea of clean cuts, pure fabrics and restful neutrality. This simple concept also provides a strong and clear brand identification. Clean cuts, pure fabrics and restful neutrality. Strong and clear message for a brand value. We are both clothing labels maker and supplier. 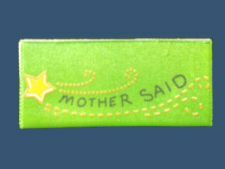 As a Clothing Label Maker our self, we are able to create completely Customized Garment Labels to suit your fashion clothing products. This includes professional perfect finishing with custom designs, and company logos added on it. 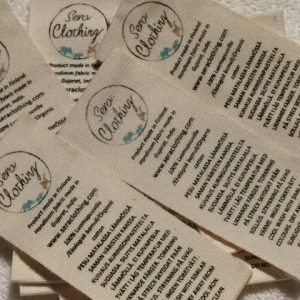 Our clothing labels collection ranging from custom made woven clothing labels, Eco-friendly 100% cotton labels, designer brand clothing labels plus much more. We supply to all manner of customers, ranging from big to small, including Dressmakers, Retailers, Tailors, Clothing Companies and Designers. We share our clothing label professionalism with all our clients to create the best quality. We also post regularly and share the latest popular fashion shows with our clients ( dressmakers, designers) and hope this help to provide the latest information regarding fashion trends. Today we are posting and sharing the following two popular fashion shows. Enjoy watching it ! Louis Vuitton Womenswear Spring summer 2014 Full Fashion Show from Runway Archives on Vimeo. Marc Jacobs Fall Winter 2013 2014 Full Fashion Show from Runway Archives on Vimeo. Contact us today, our contact details are here; we will help you to create bespoke clothing label for your fashion clothing products. We are a professional woven label maker. We transform your design into high definition, professional clothing woven label. All of our bespoke clothing labels are made of durable materials and vibrant finishes. The advantage of choose us for your custom made woven designer label is that we are both supplier and manufacturer which enables us to provide a flexible manufacturing service and a very competitive price to all our brand customers. 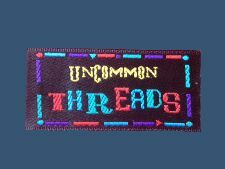 Our customers love our woven labels design. View customers review here. We offer full detail personalizes services in manufacturing the best brand quality products, we also provide a fast turnaround delivery to allow you to gain the precious timing to launch efficiently and effective new products in your target market. Read about our completely custom woven label service where we can create custom labels to suit your company image and fit in perfectly with your products. See more of our Garment Labels on video, click play button here. See our printed clothing label service where we can transfer the image in your head onto the perfect label to suit your brand and image. Cotton thread is very soft, fluffy with staple fiber. You can see this nature from the surface of finish cotton fabric. The fiber is almost pure cellulose. This fiber is most often spun into cotton yarn or cotton thread and used to make a soft, breathable textile. That’s why many clothing designers prefer to use this natural fiber, environmental-friendly cloth in clothing today. And this nature-friendly message is often expressed through their designer cotton clothing labels. Give your clothing products an ultimate finishing touch. 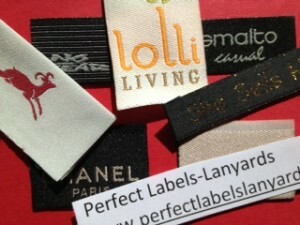 Perfect Labels-Lanyards is one of UK leading garment labels suppliers. We provide professional labelling services to help our clients to develop their outstanding brand garment labels. The most popular brand clothing labels are damask woven labels, taffeta woven labels, and satin woven labels. 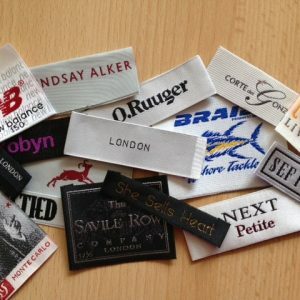 Our custom garment labels can be created to your specification, a number of sizes, colours, designs and widths to suit your every requirement creating a truly unique. 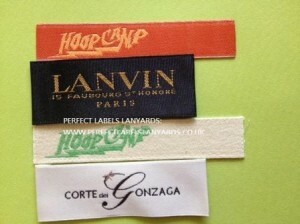 Perfect Labels-Lanyards is a UK based garment brand label supplier. We provide professional knowledge and labeling solution related the design of Garment Brand Labels and Lanyards with quality reflecting our customers’ brand image and corporate culture. This enables us to build a strong bond and positive partnership with all our customers. We are able to create completely Customized Garment Labels to suit your products. This includes professional finishing with custom designs and company logos attached. We supply to all manner of customers, ranging from big to small, including Dressmakers, Retailers, Tailors, Clothing Companies and Designers. For more information regarding our range of quality garment labels or to talk to one of advisors contact us.